SUPER TIP: Insert "ez" before the word "FACEBOOK" in the URL address to download videos automatically from Facebook.com as the fastest way! You are surfing Facebook with lots of fun videos that you want to save it for watching again but you don’t have any available software on your computer to download it. Thankfully, if you want to store your favorite videos from facebook, to keep up with the digital world, it’s easier than you might think. With https://ezdlvid.com, you don’t need to register an account, pay for services, or even install any software. 1. How can I download Facebook videos as mp3? 2. Can I download a Facebook video stream? 3. Can I download a personal video sent in Messenger? 4. 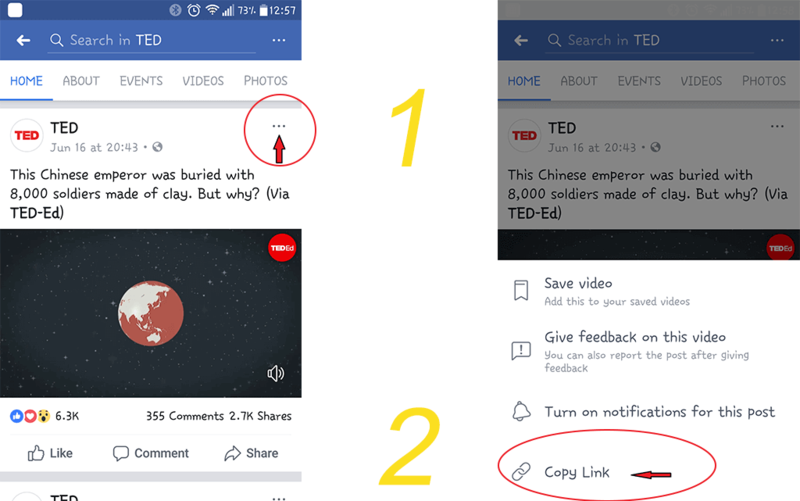 Can I download Facebook video shared in Messenger? 5. How can I download free Facebook videos in HD? *** Please note that the Facebook video must be public in order for you to download it, videos from friends that are shared only with friends (or friends of friends) cannot be downloaded. In this case, to download private facebook video, please try Convert Video method. Step 1: Open Facebook.com, find the video you want to save, then Right Click the video and choose Show video URL. Step 3: Go to https://ezdlvid.com in your browser and paste the URL into “Enter video URL” text box at the top of the page, then click Download. Step 4: Select your preferred video format, SD quality or HD quality (if available) and click on icon download at the corresponding line. This plugin is a bookmarklet which is a tiny program stored inside a browser bookmark, and it's typically executed by clicking a button in the browser's bookmarks/ favorites toolbar, you can download your favorite facebook video anytime, anywhere. Step 2: Open the Facebook videos you want to download, click on the video to play it on the large screen. 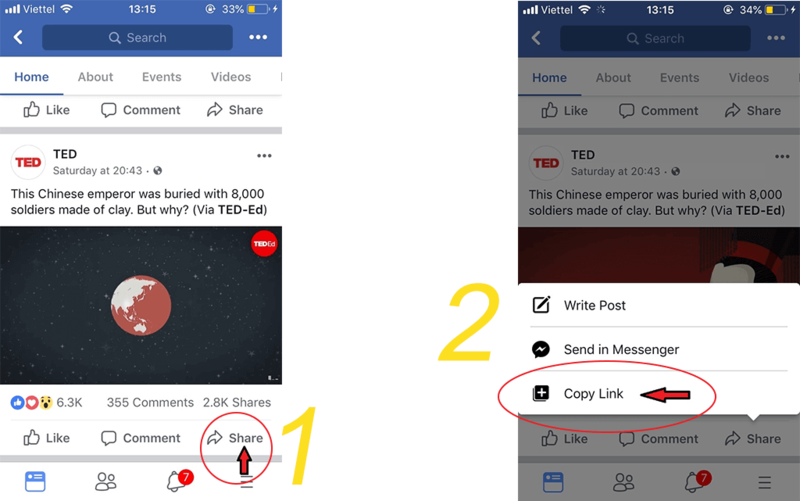 Step 4: Select your preferred video facebook format, SD quality or HD quality (if available) and click on icon download at the corresponding line. Step 1: Open Facebook app, open the video you want to save, look closely at the top-right of your screen, you’ll see three dots arranged horizontally. Tap on it. Step 2: Some options will pop-up. Tap on Copy link. Step 3: Go to https://ezdlvid.com in your browser and paste the link into “Enter video URL” text box at the top of the page, then click Download. Step 4: Select your preferred video format, SD quality or HD quality to download. Step 1: Open Facebook app, find the video you want to save, tap on the Share button. Step 2: Some option will appear, choose Copy link. That’s it. Simply paste the link of the video you wish to download and the top-notch technology will ensure your work is done smoothly in a jiffy, so you can enjoy your favorite video by downloading them on your mobile or computer within minutes, saving all your most-loved content offline like never before. You can save Facebook video as mp3 with Ez Video Downloader by simple 3 steps. Open the Facebook page with the video that you want to convert to MP3. When you're there, copy the URL address. Launch EZ Video Downloader at the address https://ezdlvid.com/, then choose tab Convert. Paste the Facebook URL into the text box, select your output format as mp3, and click Convert. This website will conduct converting, right when it's done, click Download your converted file. Sure. You can download a Facebook video Stream with my webiste. Find the video you’d like to download and click on the time stamp to open it up and start playing it. Now copy the URL from your browser’s address bar, then go to EZ Video Downloader and paste the URL. You’ll have the option to download in some available formats. Click the Download icon, and the stream video will be in your devices as usual. Scroll through the conversation until you find the personal video that you want to save. This must be a video that was taken by either you or someone else in the conversation. Tapping and holding the video will prompt a menu to appear at the bottom of the screen. Tap Save video and the video will download into your phone's Photos or Gallery app. On Messenger for PC, all you need is to play the video in large screen, on the left corner there is a Download button, click it to grab your Messenger video immediately. You can download most public videos; you cannot download videos which are private or shared with "Friends of Friends" permissions. Here is the guide. Scroll through the conversation until you find the video that you want to save. Remember, the video must be a public post. Tap and hold the video then tap Save for Later. Next, open the Facebook app. Tap on three dashes icon, which is in either the bottom-right corner of the screen (iPhone) or the top-right corner of the screen (Android). A menu will appear, let’s scroll down and tap Saved. Find your saved video and Tap on three dots icon. Choose copy link and continue downloading steps as usual. Of course, you can. With our website, you can ultimately save and convert everything for free. As soon as you choose the format of the downloaded video, select the video with the highest supported format. The HD Facebook video will be right on your devices without any problem. One more thing, the facebook video that you want to download must supports HD quality. We all go through the phase where when we download the video either neither of high quality or is broken and let’s not forget the wait we have to do. That moment we all think of a way we can quickly download videos from Facebook with high quality. There is a number of sites in Google who promises to deliver high-quality videos but often the software itself is broken or doesn’t really stand up to its impression. We have all had that disappointing moment. Let’s bring you a ray of light in your darkest non-streaming ours. We present EZDLVID.com. A free facebook video downloader that will download Facebook videos in the easiest and quickest way possible. The best part is that you don’t need to install it to use it. Just put the URL of the video in the method described below and see the magic happen. Why we call it the best part because downloading software always possesses some risk to the computer and they constantly require for an update which of course takes more space. Through EZDLVID.com you can download videos from Facebook and any site in any format. It’s unlimited and fast, it's not just simple download but it is also a facebook video converter, cutter, and editor. All for free! EZDLVID.com makes sure that they provide high-quality service and make your browsing experience more fun. The videos downloaded through the software are always of high-quality and bug-free. Their mission is providing reliable all in one platform where people just can download videos from facebook but also edit and convert them. There are no hidden baggage’s or sign in traps. You can forever use this website for an unlimited experience and fun. Now, let’s break down the steps on how you can download video from Facebook.